Our loftiest feather bed mattress topper will entice you into its cloud of soft, billowing Resilia® feathers. Meticulous pleating in each corner of our baffle box design create a feather bed so poufy you’ll want to jump in and curl up well before bedtime. We love your SuperLoft Feather Bed! We have it on both beds, home and our vacation home. We sleep like we've never slept before! So much better that those "other" mattresses! Thank you! Supreme luxury is the standard in our SuperLoft™ Feather Bed. A billowing blend of fluffy Resilia® feathers loft like never before inside our durable 230 thread count, 100% cotton cover. With years of experience in bedding innovation, Pacific Coast® has patented this unique design showcasing carefully crafted fabric boxes with pleating in all four corners so the fluffy fill can loft to its very fullest. Internal 3-D boxes in the True Baffle Box construction maximize your comfort by keeping the fill evenly distributed inside. A 2" gusset or fabric wall around the perimeter, keeps the feathers full and inviting right to the very edge. Our SuperLoft™ Feather Bed will hold your body in heavenly bliss while cushioning pressure points like those in your shoulders and hips. Printed handles are included so fluffing and refreshing this cloudlike topper couldn’t be easier. Feather beds require some maintenance learn how to keep them fluffy and new. Our gusseted pillow and feather bed designs are made by sewing a small strip of fabric-- 1/2 to 3 inches wide -- between the top and bottom cover of the product. 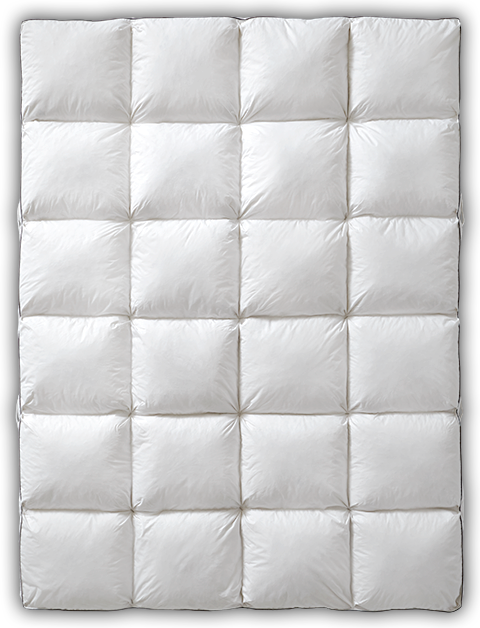 This fabric insert allows our down and feather fill unrestricted space right to the edge of the pillow or feather bed. Gusseted pillows are especially comfortable for side sleepers as the shape fills in at the space between your head and shoulder supporting the proper alignment of your spine. With our feather beds, the gusseted edge delivers night-long support to the very edge of the bed. Our patented SuperLoft™ design combined with a two inch gusset makes this feather bed our loftiest style with a luxurious, high sink experience. Across the feather bed, meticulous pleating in the corners of each baffle box opens up to provide more room within for our springy Resilia™ feather to fully fluff and expand. With over 130 years of down and feather expertise, we’ve perfected an exclusive process that results in tightly curled feathers that are springy yet soft. Unlike ordinary feathers, our Resilia™ feathers Stay Fluffy Longer™ and provide you with outstanding resilience and support. Our lofty feather beds look and feel their very best when fluffed up regularly, that's why we've designed them with convenient, easy care handles. With two fabric handles on either side of the bed, moving and refreshing your feather bed couldn't be easier. Barrier Weave® specially woven to prevent down and feathers from sneaking out. Full - 55" x 76" x 2"
Queen - 61" x 81" x 2"
King - 77" x 81" x 2"
Cal King - 73" x 85" x 2"